Ariana Grande's manager defended Pete Davidson from trolls—"stop the bullsh*t"
Even though Pete Davidson and Ariana Grande parted ways on relatively good terms (after some minor social media drama, Davidson voiced his admiration and respect for Grande in a segment on “Weekend Update”), it seems as though some of the singer’s fans are still taking sides. The SNL star returned from his social media hiatus to post about his upcoming movie, Big Time Adolescence, and a number of Grande fans took to the comments section to drag him. “Ur cancelled tysm for breaking with Ariana bc she’s doing much better BYE,” someone commented. 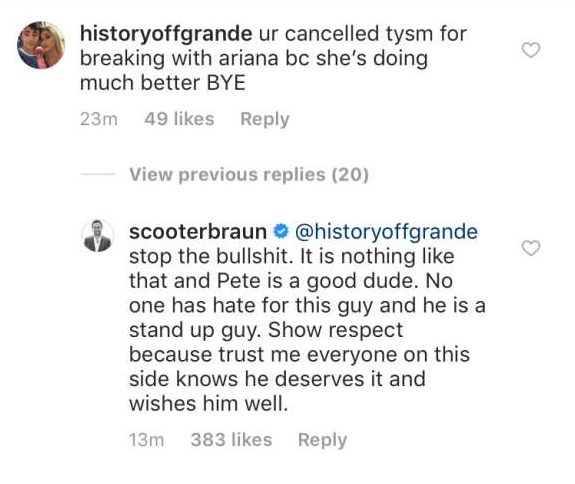 Many others simply wrote, “thank u, next.” And apparently, Grande’s manager Scooter Braun is not here for it. Braun represents the likes of Justin Bieber and Carly Rae Jepsen and is known to have a strong connection and friendship with his clients—so we have a feeling his opinions accurately reflect how Grande feels about the situation as well (though we obviously can’t know for sure). At the end of the day, relationships are hard, and they don’t always work out—even when both parties are stand up people. So let’s go a little easy on both Grande and Davidson right now, guys. Because the world can use some kindness.